Looking for an easy to prepare appetizer that involves some fresh vegetables? 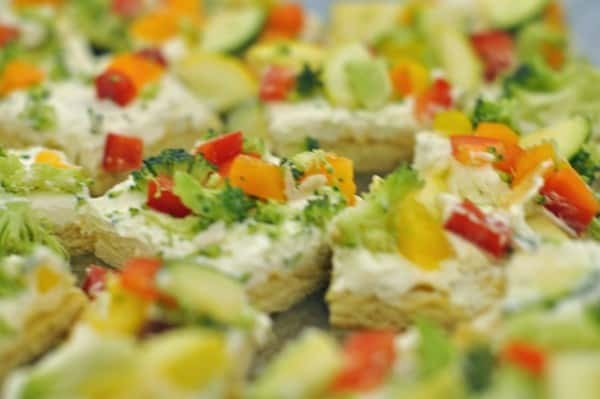 This recipe was inspired by, what I believe is a Pampered Chef recipe, Crescent rolls, cream cheese, and a host of fresh vegetables makes a pretty creation for you and your guests. Veggie Patch Pizza has had to recent appearances at parties I have been involved with recently. Sometimes when throwing a party you need both hot and cold appetizers to get you through an event. This is a pretty appetizer to serve, you an top it with basically any fresh vegetables you have on hand, and you don’t have to be too exact when you measure out the vegetables when you sprinkle them over the top of the pizza. You can also vary the toppings for personal preferences. This makes up a wonderfully colorful appetizers that you can make ahead of time, and finish at the last moment. The Veggie Patch Pizza is made from crescent rolls, cream cheese, and fresh vegetables. Spray a large cookie sheet with non-stick spray. Lay out crescent rolls on cookie sheet. Simply unroll the dough, do not separate it out into triangles. Press indentations of the flat. Bake for about 12 - 15 minutes, or until golden brown. Allow cooked dough to chill before proceeding. In a medium-sized bowl combine cream cheese, mayonnaise, dry ranch dressing mix, and dehydrated onion together in a bowl. Spread cream cheese mixture over cooked crescent roll dough. Top with veggies sprinkling the veggies evenly over the pizza. Cut immediately, even if you aren't going to serve this immediately. If you wait on cutting this for too long, the cream cheese layer will lift off the dough. Your Veggie Patch Pizza can be made a day in advance, but make sure you cut it before you cover to store the Veggie Patch Pizza. Have you ever done an Applebee’s version of this? is it possible to rewarm this pizza, or does it have to be served cold? I can hardly wait to try this recipe. I would not re-warm this at all. I think the cream cheese would melt into the crust. This is best served cold. I was so hoping this was going to be Applebee’s Veggie Patch Pizza! Oh well, looks great anyway, thanks for the recipe!